Up until early April this year, the Otjikoto mine, which achieved commercial production in February 2015, was powered by heavy fuel oil (HFO) diesel generators. The open-pit gold mine obtained 100% of its energy requirements from the 24MW HFO power plant; and according to B2Gold, with a consistent demand of 12.5MW per day, the plant consumed 21.7 million litres of HFO during 2017, costing approximately US$10.5 million. 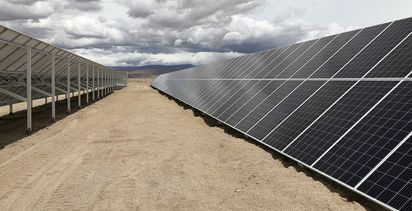 However, back in 2012, during the mine's feasibility study phase, the company says it was already playing with the idea of introducing solar power to the site. 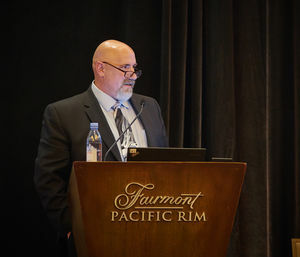 In an energy-intensive industry like mining, energy efficiency can translate into large cost savings, and Bill Lytle says B2Gold examines energy efficiency initiatives starting at the design phase. 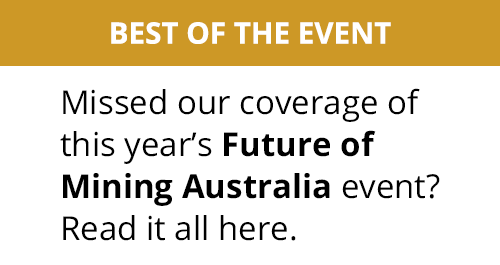 "Climate change is an increasingly important global challenge for businesses and communities, so sustainability initiatives, such as reducing greenhouse gas emissions, have come to the forefront of discussion across the natural resource extraction sector. "B2Gold is certainly cognisant of this and has looked at how we can reduce energy consumption, and where there is a business case, preferably reduce its dependence on fossil fuels in favour of cleaner, less expensive power sources," he says. When B2Gold first entered Namibia, the country was suffering from a power deficit and importing a lot of its energy from South Africa and Zambia. 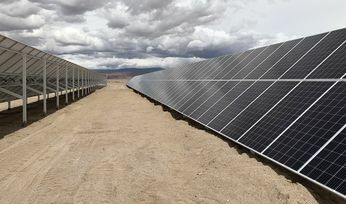 At the time the company looked at different power options, including using overhead powerlines, a diesel-powered plant, coal, HFO - and, of course, solar - the project is, after all, located in a country with great solar productivity potential. "We looked at all of these options, and really the key [deciding factors] were the tight timeline for construction, the cost, and how [the solution] would integrate with what the government already had in place. "At one time we thought we would just use the overheard powerline and buy power from the Namibian power authority, but the reality was that they couldn't guarantee power 24/7; they were having rolling brownouts at the time, and so advised us that we needed to build some sort of on-site power plant regardless." Lytle, who at the time of the initial feasibility study was B2Gold Namibia's country manager, adds: "At that time, the solar manufacturers in the southern part of the world weren't capable of producing at the speed we wanted to, so we made the decision to go [with] HFO, but we always had the idea that we'd come back to the solar plant - and it worked out." 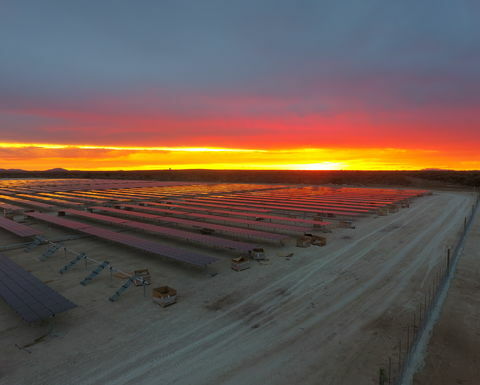 From day one, the plant was designed in a way that all transformers were able to run all three types of power models - powerline transmission, fuel and solar - so the eventual move to solar was achieved with minimal disruption. 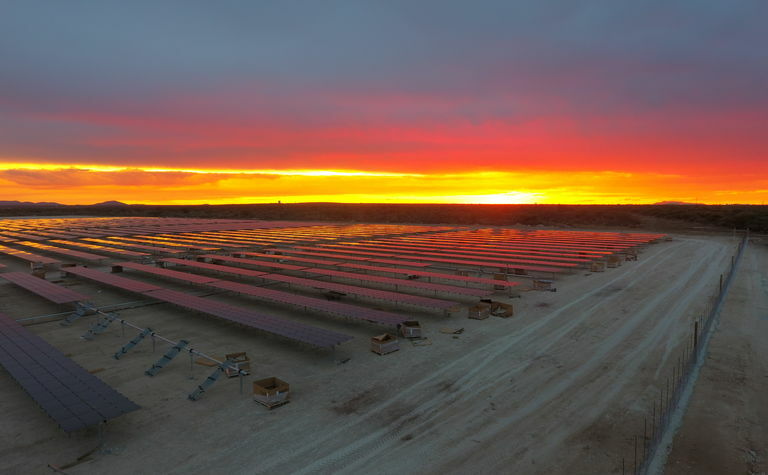 Lytle's successor in Namibia was briefed on the plans for the Otjikoto solar power plant, and in early 2016, the company embarked on a detailed financial feasibility study to prove the financial viability of adding a 7MW solar photovoltaic (PV) power plant to the mine's energy portfolio. The study indicated expected savings of 20% of HFO consumption through the reduction of load to the power plant, as well as savings on maintenance costs on the power plant's HFO engines. Initial estimates yield a payback period of approximately four-and-a-half years. According to B2Gold, the solar plant will enable it to significantly decrease fuel consumption and greenhouse gas emissions from Otjikoto's operations, as changing the Otjikoto HFO power plant to an HFO-solar hybrid will help lessen Otjikoto's reliance on HFO. The company expects that this will reduce HFO consumption by approximately 2.3 million litres and lower associated power generation fuel costs by up to 14% in 2018. Based on these results, the project was approved in October 2016 with an estimated project cost of US$8.5 million. 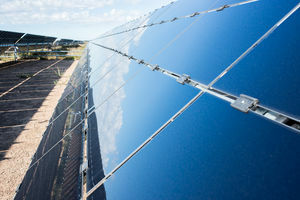 "We then went through an open-tender process, and because, at that time, solar had become a very hot topic in that part of the world, it was a very competitive environment whereby there were a number of potential vendors that wanted to work with us on the Otjikoto solar plant," Lytle says. The Otjikoto solar plant project team ended up choosing Cat Microgrid Solutions as the EPC contractor for the construction of the plant, which is partnered with local dealer Barloworld Power South Africa. The decision was principally based on the technical capabilities offered by the Cat Master Microgrid controller (MMC). B2Gold had already worked with Caterpillar at Otjikoto, as they also supplied the original 24MW of power capacity to the Otjikoto mine, when it opened in 2014, through four Cat medium-speed HFO generators and three Cat 3516 high-speed diesel generators. The MMC was of particular interest to B2Gold as it has been specifically designed to seamlessly integrate the solar PV energy with Otjikoto's HFO and high-speed engines, and has the capability to automatically select the cheapest form of energy (from the multiple sources of energy available) with no human intervention. "During the daylight hours obviously solar is the cheapest by far, and then … if a cloud comes over and suddenly the solar plant is unable to deliver enough power to the plant, then the microgrid itself will determine that it needs power immediately and turn on the cheapest generator." As another example, Lytle mentions the solar plant at Iamgold's Essakane mine in Burkina Faso - while twice the size of Otjikoto's plant at 15MW - is not fully autonomous. On the other hand, the Otjikoto solar plant, which was officially opened on May 29, is one of the first fully autonomous hybrid plants in the world and forms one of the largest installations in Namibia. The current topic of discussion at B2Gold, besides potentially introducing solar to its Fekola mine in south-western Mali, is the future of the Otjikoto power plant, well beyond the life of mine. "The north-central part of Namibia is an area that is still power-starved. So, the fact that the HFO-solar hybrid Otjikoto plant can generate more than 30MW could certainly be a national asset," says Lytle. By constructing and running an overhead powerline to connect the Otjikoto plant to the national power grid would allow for revenue generation. There is also the possibility that B2Gold will expand the solar plant, which will, in turn, increase revenue generation potential. "Once the mine has shut down, we could partner with the Namibian government by exporting and selling energy back to the grid; 31MW would be quite profitable. "This revenue could potentially allow us to continue to develop some of our corporate social responsibility projects in the region; the plant could be used as an income-generating asset, whereby funds could be used to support ongoing community development activities, such as our education and health programmes, as well as environment and conservation programmes." While renewable energy has been integrated into a fair few mining projects of late, the industry still seems somewhat hesitant to embrace change. "I think, in general, mining companies don't want to be serial plate no 1 on any technology," says Lytle. "They want to make sure it works somewhere else before they invest in the technology. 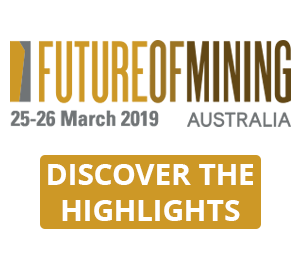 "However, across the mining sector, there's great technological innovation, and it's this innovation that's revolutionising the mining industry - power generation is no different." With projects like Otjikoto and Essakane leading the way and proving the technology's capabilities and feasibility, more mining companies might soon be ready to jump on the solar bandwagon.